What would be spring without ramson? For us, it is the harbinger of warmer days and we are looking forward to bulging farmer’s markets more and more. Since ramson is very rare in Northern Germany, and is listed for endangered species in and around Berlin and not even allowed to be plucked, we picked the small brother, allium paradoxum. 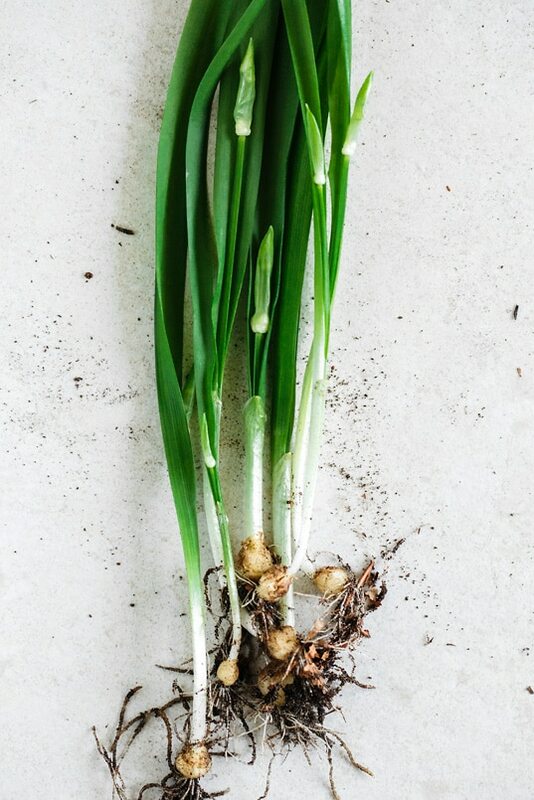 The few-flowered garlic is also known as Berlin Leek in German, and for a reason: the woods and parks in Berlin and Brandenburg are full of it. However, it has not quite the tangy taste of ramson, it rather reminds us of chives with a delicate garlic note. That’s why in our recipe the garlic flavour is rather subtle, and garlic enthusiasts can alter the ratio of ramson and spinach. Cook the potatoes with their skin until ready. Meanwhile, heat the oil for the sauce in a sauce pan, add the beans and braise them lightly. Deglaze them with white wine before adding the vegetable stock. Let the beans simmer for about 10 minutes, then blend them and season with lemon juice, salt and pepper. Let the potatoes cool down for a while, peel them and squeeze them through a potatoe ricer. Season with salt, pepper and nutmeg, and knead the mass with semolina and flour until you have a smooth dough. The dough shouldn’t be sticky, you may have to add more or less semolina and flour, depending on the potatoes. You also may have to add a bit more salt in the end. We roll the dough for this dish in walnut sized balls over a gnocchi board. Heat well salted water until it simmers. Cook the gnocchi until they float on top and scoop them out. Sauté spinach and ramsonin a large frying pan with olive oil until the leaves coincide, season with salt and pepper. 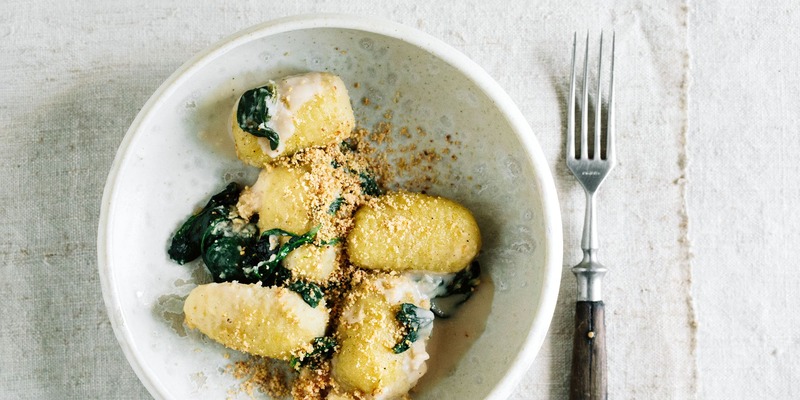 You could now add the gnocchi to the leafy greens, pour the sauce and shortly boil it down. Voilà, now you have creamy gnocchis. However, we like our gnocchi crispy. 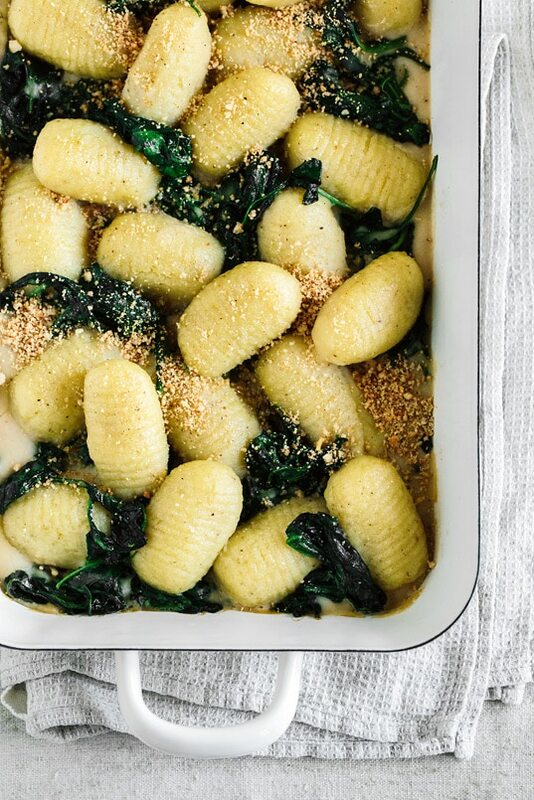 So we scatter the spinach, bear leek and sauce in a gratin dish, layer the gnocchi above and slightly sprinkle them with olive oil. Bake at 180°C in the pre-heated oven for 25-30 minutes. Grind the pine nuts and scatter them for the last 5 minutes of baking over the gnocchi.